1. Quiz: What is HyAlfa'? 3. Quiz: What are the inferior planets? Those whose orbits are smaller than Earth's ie; Mercury and Venus. 4. Quiz: What is the fourth dimension? 5. 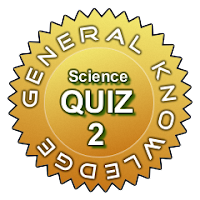 Quiz: If in a molecule of water one or both the normal hydrogen atoms is replaced by deuterium what does one get? 8. Quiz: What is the word meaning 'the search for animals whose existence has not been proved'? 9. Quiz: Which organ beats 35 mn times a year? 11. Quiz: What is cryonics? The storage of dead bodies in liquid nitrogen in the hope that they can be revived one day. 12. Quiz: What is calcium sulphate better known as? 18. Quiz: What is anosmia? Whole or partial loss of the sense of smell. 19. Quiz: Who performed the world's 1st successful heart transplant? 20. Quiz: What is the term for the radioactive fragments and isotopes that fall to Earth from the atmosphere after a nuclear explosion? 21. Quiz: What is the full form of 'laser'? Light amplificati0n by stimulated emission of radiation. 22. Quiz: What did Jethro Tull (1674-1741) invent? 23. Quiz: Paul Broca was a pioneering French surgeon, neurologist and anthropologist. Name the 20th century scientist who wrote a book titled ‘’Broca's Brain’’. 24. Quiz: Which thinker-writer spoke of 'charisma' and 'the Protestant work ethic' as important in history? 25. Quiz: What is 'homeostasis'? 29. Quiz: What is the Komodo dragon? The largest extant lizard species in the world; found on Komodo Island in Indonesia. 30. Quiz: Name the astronomer who discovered that Earth and the planets travel about the Sun in elliptical orbits.